Nottinghamshire has been hit by an earthquake with a magnitude of 2.6, the British Geological Survey has confirmed. 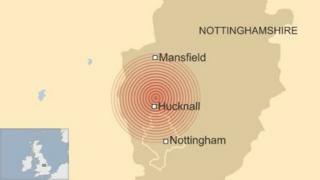 The earthquake struck about 1km (0.6 miles) from Hucknall at 19:17 GMT, at a depth of 7km (4.4 miles) below ground. People have reported hearing a loud bang and feeling sharp shaking. Residents in Mansfield, Papplewick, Kirkby-in-Ashfield, Sutton-in-Ashfield, Ravenshead, Newstead Village and Blidworth all reported the quake. Stephanie Holland, who lives in Kirkby-in-Ashfield, told BBC Radio Nottingham: "We were sitting in the lounge watching TV and there was suddenly a very loud boom and the floor shook. "I felt as though it had lifted me off the seat and then there was a rumble. "We've got those road humps outside the front of the house and quite often when a bus goes over it shakes the house. Well this was like a bus on steroids, it lifted the whole floor." She said the earthquake lasted between 10 and 15 seconds and brought her neighbours out of their houses. "It was quite scary actually," she said. "I had got horrors of it being a gas explosion." Surprised residents took to Twitter to discuss the earthquake, although some poked fun at the size of the tremor. Glenn Ford, a seismologist from the British Geological Survey, said: "The BGS has been receiving reports from areas sort of south of Mansfield and north of Nottingham tonight of an earthquake. "At the moment it's all indications it's a typical British earthquake that we see quite often throughout the year." People have reported the quake via the online reporting facility on the BGS Seismology website. The reports described "a heavy rumble as if some big lorry had passed", "vibration lasted for a few seconds with a rumbling noise" and "a loud bang and a shudder". On Sunday, a tremor with a magnitude of 1.7 was recorded by the BGS in nearby Newark.